Why are ham fests sometimes in very strange locations? A couple of posts ago we wrote about Herb’s and Jim’s unplanned 10 mile hike in the desert. More significant, really, is why were we in the middle of Arizona’s desert at all? You might already know we are suckers for interesting or unusual ham radio conventions. 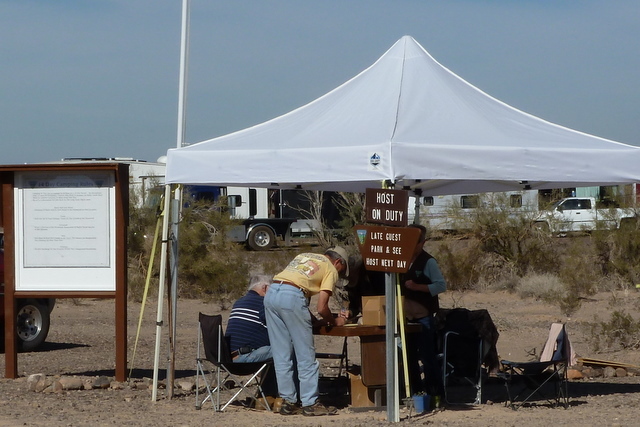 A ham radio convention in the middle of Arizona’s desert would probably be interesting and unusual. We’d heard about Quartzsite for several years and wanted to get there. This seemed like a great opportunity, and we only had a drive of 160 miles to get there. Less than 700 miles to visit a new hamfest? Let's go! Some of you dear readers may recall our post two years ago when Debbie and Jim drove to Essex, in the top of Montana for a famous ham fest. 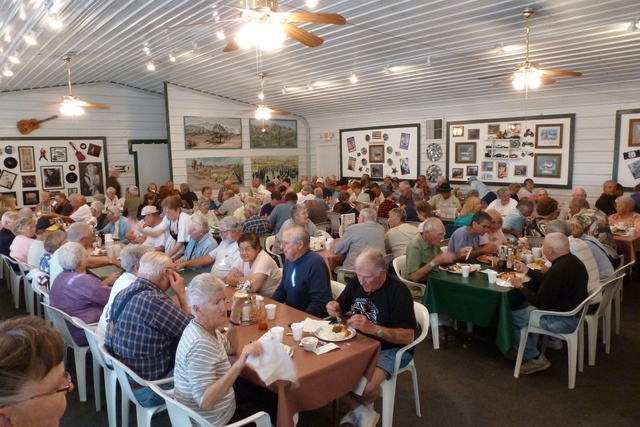 We had heard of the oldest continuous running (once per year, that is) ham radio convention, the Glacier-Waterton International Peace Park Hamfest. 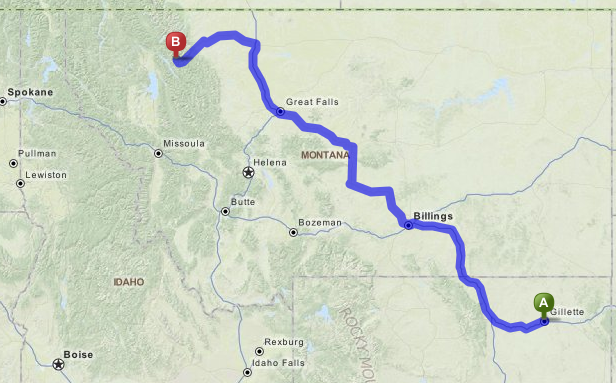 And so upon departing Gillette Wyoming in early July 2010 we reasonably figured, since we were only 600 miles away, we should take the opportunity to visit Essex Montana and see this venerable ham fest first hand. It was pretty neat and sharpened our interest in unusual ham fests. Some things are remarkably similar between the two hamfests. At neither hamfest did we see any ham radio vendors (although one almost always does). Both hamfests are pretty close to an international border (Canada and Mexico). 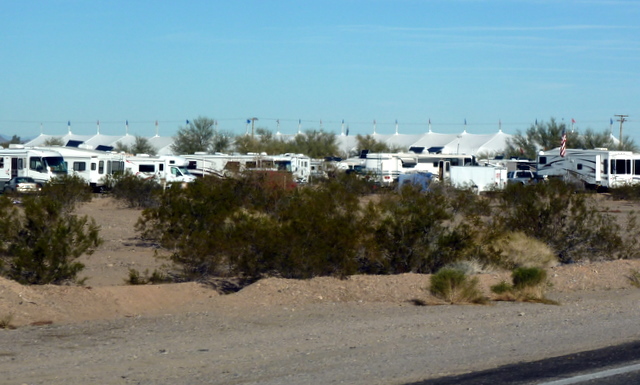 Both hamfests involve dry camping although in Quartzsite the term takes on additional significance — everything is really really dry. 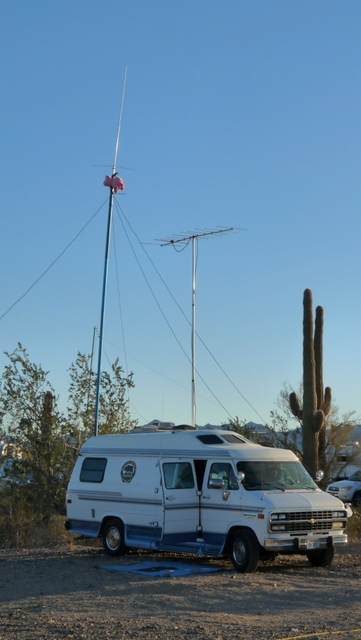 Both hamfests had very dedicated RVing hams with some really interesting antenna setups. Both hamfests had special event stations allowing attendees the opportunity to operate from a different location and try using different gear than in their own station. Both hamfests had well-organized presentations on various subjects. The QuartzFest rally seemed huge compared to the Glacier-Waterton International Peace Park HamFest. We might have had 75 rigs at Glacier-Waterton, and we had 400 rigs at QuartzFest. 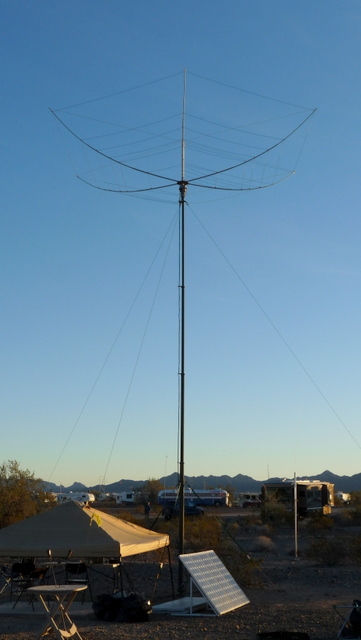 We never had seen such a big collection and wide variety of amateur radio antennas as at QuartzFest. Not all were RV-portable – many were tall masts with two and three sets of ropes guying the antennas against the winds. Oh, and we saw assorted ways to collect solar energy for electricity as well as several wind generators. 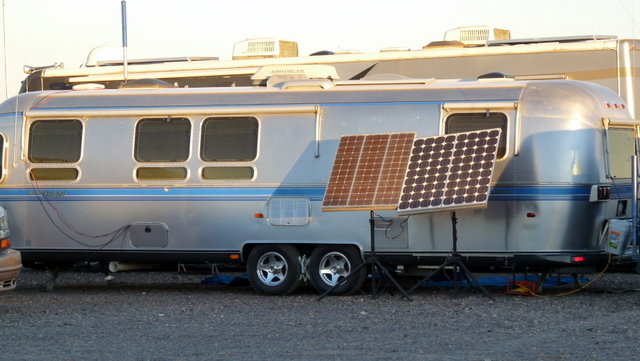 We went to a lot of work putting our solar panels on the Airstream’s roof — they would be low maintenance (sort of) and pretty secure from theft or damage. Tilting the solar panels wasn’t in our original scheme and weekly wiping of the panel’s glass surface (necessary in the dirty dusty desert and even in Mesa) requires setting up and climbing the ladder. We like this portable panel idea more and more. 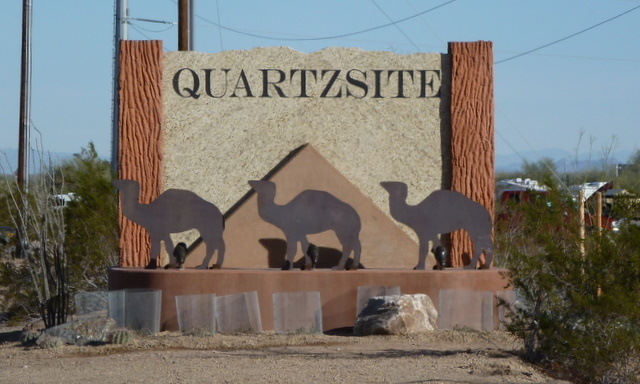 When in Quartzsite, do as the Quartzsitians do? We followed our friends Bob K9WMP and Laura K9BZY from Mesa to Quartzsite since they knew where to go. And we followed them to Sweet Darlene’s restaurant for Friday fish dinner our first evening. Without Bob and Laura we probably would have given up this idea when we saw the lineup outside the restaurant — this place was hopping. Herb and Lois, Tom and Debbie, Bob and Laura, and the two of us were deluded if we thought we would get to sit together in this place. The line moved reasonably quickly and we soon found out why — you don’t wait for a table of four, or six, or eight — you wait for a couple of chairs anywhere close to each other and you forgo sitting with your larger party. 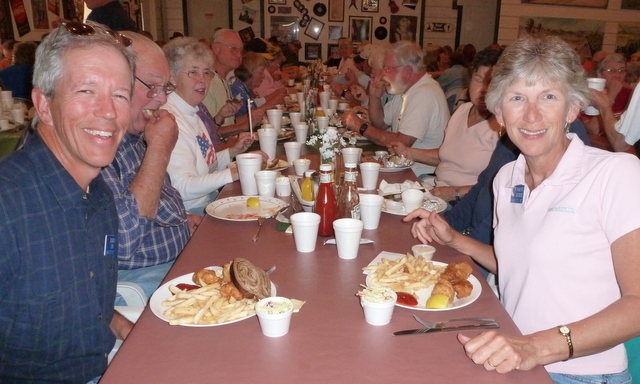 Your food order at Sweet Darlene’s Friday fish dinner is simple. Fried fish, cole slaw, and a slice of bread are on all the plates — you choose what style potatoes. Except our wait person was so frazzled by the time she arrived at our table she asked what style fish we wanted. Faked us out briefly then we all had a big laugh — there’s one style fish at Friday fish dinner at Sweet Darlene’s, and it was good. Can we take one of these home? 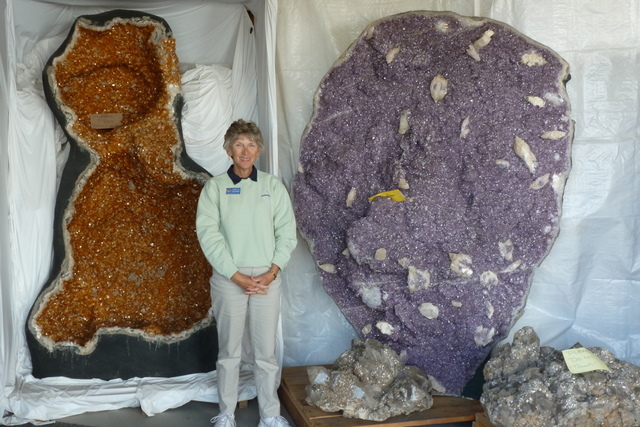 People we meet in Mesa think of Quartzsite as a place to shop for gems and geodes. While we don’t frequent rock shops we have been in a few. We’ve never seen anything equalling these huge geodes. We didn’t see any price tags but wonder if everything is for sale at some price. Clearly the biggest tent we've ever shopped in! Another thing most people do in Quartzsite is browsing the shops. 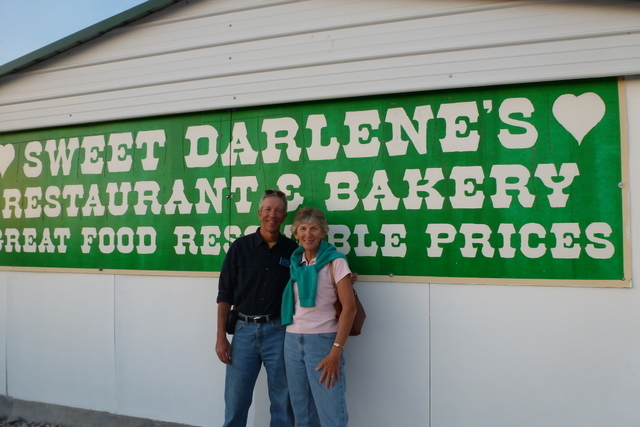 Sweet Darlene’s has graduated from a tent enclosure to a completely enclosed metal structure. Some of the shops are in metal buildings but most were in tents. One of the tents seemed as big as a football field and was chock full of vendors representing nearly every facet of support and supply for RVing. 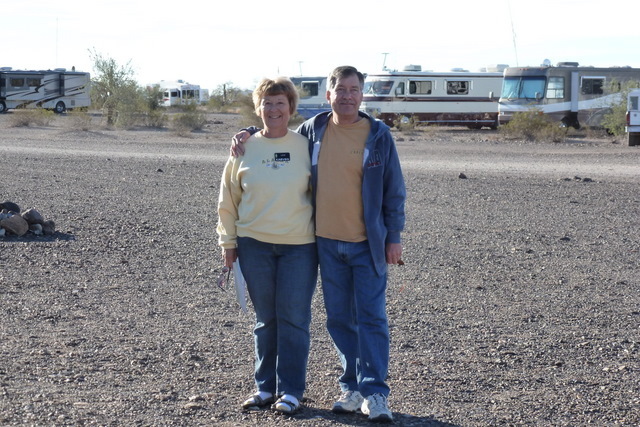 We camped in Road Runner RV area of the BLM land 6 miles south of Quartzsite. BLM required us to register and receive a 14-day camping permit (at no cost), allowing us to park anywhere within a vast area of the desert. The closest dump station and fresh water resupply was in Quartzsite, and we couldn’t even find a 30 amp power pole in our camp site. Nor did we really expect one, we knew we’d be conserving water and battery power both. We’ve dry camped numerous times but had not previously done nearly so well with our fresh water. We used less than 20 gallons total of fresh water in five days for all uses — cooking, drinking, and bathing. Our Airstream travel trailer carries 40 gallons, so we had water aplenty. Not so capable though is our 19 gallon black water holding tank. The only thing it serves is our toilet. Some of the 20 gallons of fresh water had to have gone into the 40 gallon gray water holding tank, right? We bathed each day and used our sink for pot and utensil washing. But the 19 gallon black water holding tank was nearly full after five full days use. Very nearly all our toilet flushing was with dish water or bathing water, so precious little fresh water found its way to our gray water holding tank. If only we could find a way to expand our black water carrying capacity. Who would have thought we’d wish for such a thing, eh? We were grateful to Herb and Lois for sharing their Winnebago’s generator with us twice a day. We ran an extension cord 100 feet between our RV and theirs and they would bump our batteries up a little. It was nice to have their big old generator send some extra energy our way a couple times daily. Even nicer, though, was camping with them and sharing meals, conversations, and spending evenings at card games or watching movies together. Maybe keeping busy is a good thing in itself? Jim’s been busy since we returned from Quartzsite. Our solar panels are, after four years flat use, tilt-able. We are on the verge of more than doubling our storage battery capacity from two 6v 220 amp hour batteries to four 6v 232 amp hour batteries. Results are encouraging on tilting the solar panels and we think the battery change will be a significant boost. We’ll get back to the details about these two changes in another blog. Stay tuned — we’ll be back soon!